When the first two seeds and favourite for the title face each other in a Slam final that seems almost unsurprising, but when that happens in both the men and women tournaments the surprise seems to suddenly increase.. Most of all the presence of the highest seeds in both finals shouldn't lead to the easy misjudgement that the tournament was boring or by any mean unsurpirsing (for more have a look at the first week report on falled seeds). Both the finals have the added drama of the great rivalries that are shaping the last seasons in a way that in both cases it seems that the stakes are beyond the title only. Rematch of last year's final (first time since 2001 when the Williams' sisters faced each other for the second year in a row), rematch of the last tournament's final they've played few weeks ago in Cincinnati, clash between the best two players in the world, the current and former world number one and there's a lot more one could say be lying behind this final, because like it or not, those two are building one of the most interesting rivalries of the past few years in the women tennis. Both girls know each other really well having played 16 times already, but despite Serena is leading comfortable the series with 13 wins, it feels like Vika is coming closer, every match between them has been a huge fight in the past two years, especially on hard courts. What's more this year the Belorussian leads the head to head, with both her wins on hardcourts, the latest in a great quality final ended 7-6 for Vika in Cincinnati. "you know, both matches she played really well." Said Serena regarding those two losses to Azarenka this year: "I let myself down at opportunities and I didn't take them. If I'm able to get another opportunity I have to take them, because she is always pumped and she does really well." People seem to argue that the two finalists runs couldn't be more different: Serena didn't drop a single set and won 23 consecutive games starting from her 4th round to Stephens to her Semifinal against Li Na, while Vika dropped two sets against Cornet and Ivanovic, being very close to be defeated in this last one. The two semifinals couldn't be more unlike as well, since Serena needed very little fight to defeat Li Na, who sprayed error after error to surrender in the first set winning no game despite the "sole" 4 winners of Serena; on the other hand Azarenka needed a great fight to overcome a tenacious Pennetta. The Italian didn't play as well as in the other rounds, but never gave up and Azarenka often needed two or three extra shots to close rallies, hence the match was tough and tiring for both despite finishing in straight sets. " She was getting to the balls, you know, sometimes I didn't expect to come back, and she really surprised me in those kind of ways. She was really solid. I just felt that I was able to play better and execute better on the important moments and really take my chances." Said Vika after the match, but for sure she'll need to upper her service level if she wants to challenge Serena, something that she usually does, like in Cincinnati, when after a shaky tournament she came up with an outstanding performance to win that one. I definitely feel like when she plays me she plays her best, by far." Said Serena about that raise of level whenever the two meet: "I have seen her play other players, and when I play her I'm playing a totally different player. Obviously she brings her best game, yeah." 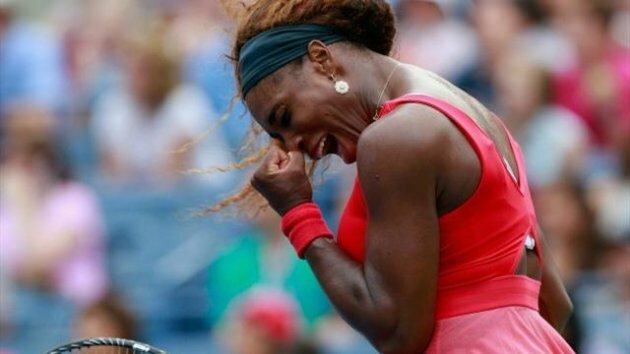 It is going to be a tough battle, that's for sure, none of the two would give up the fight, they are both great fighters and as said above, there's a lot of extra motivation (Serena as US Series winner has a 1 million dollars bonus too) and to use Azarenka's words: "It's tough to say. I think that, you know, the battles that we had, it was really just taking each other out of the most comfortable zone and just fight for every ball. Because, you know, we know each other pretty well. You know, I know her strengths; she knows my strengths. That's what it's all about, about those turning points, who wants it more, who's willing to go for it more. It's a bunch of combinations." It's hard to pick a winner, I believe that Serena will in the end take this one, but she stands her best chances if she can avoid a 3rd setter. As for the women final, this is the nth chapter of a great rivalry and once more a win on Monday will mean a lot more than the already huge title of USOpen champion. The two know each other as well as they know themselves with 36 previous matches played and Nadal leading with 21 wins, but most of all with the last one gained in a tough and close battle on the summer hard courts. Nadal is clearly the favourite, everything is by his side leading into this final, starting from his terrific season record (60 wins to only 3 losses), passing by the fact that he's yet to be defeated on Hard Courts, he leads the head to head and ending to the route to this final, in which he dropped a single set to Kohlschreiber. Djokovic's season would be looking outstanding in any other season, but it simply fades if compared to the one of Nadal and despite being still at the top of the ranking, the Serb is sure to see the Spaniard passing him within the next weeks. Nonetheless this is the perfect stage to set a clear statement that he's not willing to give up the fight and after all they tie with one slam each, so there's still a chance to do better than the Spanish, at least in this category. Nole knows he'll need to bring his best if he wants to threat Nadal: "it's always the biggest challenge that you can have in our sport now. I mean, he's the ultimate competitor out there. He's fighting for every ball and he's playing probably the best tennis that he ever played on hard courts. but, you know, I know how to play him. Hard court is the surface that, as I said, is my most successful surface. I have played him already here twice in the finals. I know what I need to do. Now it's of course easier to sit here and say, I know what I need to do, but I've got to do it on the court." What's for sure, he will need a great effort from his team to recover from his semifinal, because differently from what I expected (you can see it in my semifinals preview), Wawrinka fought like a caged lion and came very close to upset the Serb and the winner could come through only after a battle of over 4 hours. On the other semifinal Nadal didn't need much time and despite his need to focus and win the important points, Gasquet couldn't do much more than staying close in the score, but in the end it ended in straight sets. Nadal remains very cautious in his words as he knows that Djokovic is a great fighter even if he's coming more tired than he is: "Few weeks ago in Montreal have been, you know, good, very good level, no, of tennis? Is good if both of us, we are playing at very good level so the match becomes great because we play long rallies, we bring our game to the limit situations, and becomes a very difficult match for both of us. Hopefully I hope to be ready for that. I don't know. I gonna try. I need to keep playing very aggressive and play a very, very good match. Only like this I gonna have chances. That's what I gonna try." Yet, I believe that Nadal has this match in his hands and probably he won't even need a 5th set to close it.